Anthony Morigerato - DWDE LTD.
﻿Anthony Morigerato is the executive director and choreographer for the New York City based AM Productions (2007-Present). Anthony was also the artistic director of the AM Dance Project from 2006-2008. As a performer Anthony has been a soloist and member of Michael Minery's Tapaholics and is the lead tap dancer and choreographer for the musical group Matt and Anthony. 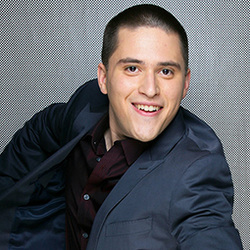 He has performed on stages all over the world and on television on the Tony Danza Show and NBC's America's Got Talent. He is also the current Guiness World Record holder for most tap sounds made in one minute. Anthony is an accomplished dancer in all disciplines having trained at Marymount Manhattan College where he performed the work of ballet and modern luminaries such as Robert Battle, Elizabeth Higgins, Jiri Kylian, Katie Langan, David Parsons, and William Soleu. He has served as an adjudicator and master teacher for dance organizations, competitions, theater schools, and dance studios throughout the nation since 1999, having students go on to perform in every medium of the performance industry on stages all over the world. Anthony continues to travel the nation performing, teaching, and choreographing, while students flock to NYC to study with him privately.